This Place of Worship was founded in 1884, though it is now closed, but we don't yet know when, and the premises are now in secular use. Kelly's Directory of 1932 describes Brookfield as a hamlet, 1 mile north of Dinting Station, and says it had a Congregational Chapel, erected in 1884, of stone in the Early English style, that all its windows are stained, and that it had 400 sittings. Old Maps, for instance OS 1899 OS 10:560 show a Congregational Chapel, and adjacent school at this location. The property is now listed as 126b Brookfield, and as can be seen from the photograph, commercial premises. Another building to the right of the chapel, with the address of 126a Brookfield, is also in commercial use (O'Sullivan Antiques); this was the school. 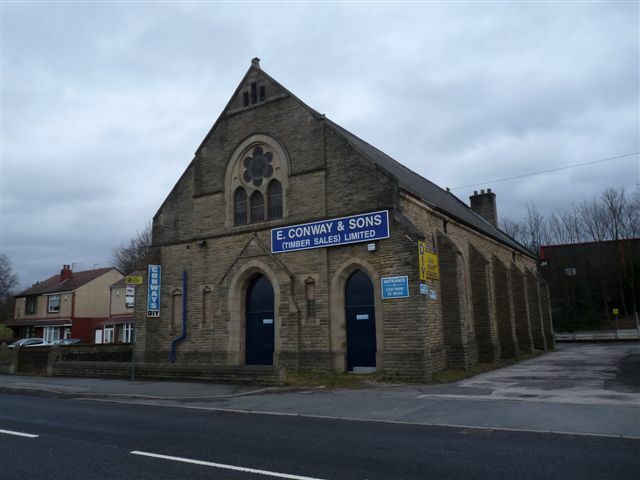 The congregation was founded in 1849 by members of the Independent Churches in Glossop, Charlesworth and Tintwistle, and met at the home of Samuel Shepley, a mill owner in Brookfield. The school house, which was built on Shipley's land, in 1852, was part of the buildings of Brookfield Mill, which had been demolished some years previously. The chapel building was erected after Shipley's death, and had a tower originally, which was demolished in the 1970s. Brookfield Independent (later Congregational) Chapel, Dinting, Glossop shown on a Google Map. I have found many websites of use whilst compiling the information for this database. Here are some which deserve mention as being of special interest for Dinting, Glossop, and perhaps to Local History and Places of Worship as a whole. Information last updated on 18 Jan 2011 at 14:17. Please also remember that the former Brookfield Independent (later Congregational) Chapel is understood to be in secular use, so care should be taken to preserve the privacy of its occupants. This Report was created 18 Apr 2019 - 09:24:43 BST from information held in the Derbyshire section of the Places of Worship Database. This was last updated on 6 Feb 2019 at 15:49.